The bilateral relationship and all encompassing national interest with African countries by the Jewish nation of Israel are well articulated in a sovereign nation of Biafra within the West African sub-region. It is therefore important that the government of Israel fully understands the monumental benefits derivable from closely working with Biafra for the interest of the Jews at home and their brethren here located in West Africa. The concealment of historical facts about Biafrans by the Nigerian government have properly been unravelled by the team of researchers of Indigenous People of Biafra (IPOB) globally, ably led by Mazi Nnamdi Kanu. Biafrans have now come to the realization that they are pure descendants of Israel owing to their patriarchal links to Eri, Areli and Arodi. These were the last three sons of Gad who happened to be the seventh son of Israel (Jacob) before their historical sojourn in Egypt. In one of the chronicled analysis recently exhumed by the Family Writers Press editorial board member, Mazi Peter Nonso Ikeh, a lecturer in one of the leading High Institutions in Biafraland, he clinically traced the historical record on how "THE STAR OF DAVID" has successfully remained the ancient symbol of recognition in Biafraland till date. This has particularly been so within the Igbo ethnic group before the expedition of the British colonial explorers in the West African sub-region. According to the research comprehensively carried out, "The Star of David" was adopted by the British overlords as a historical symbol of the Biafran people in such a way that it got engraved in one of the coins formerly used as a legal tender during the British colonial administration in Nigeria. It was essentially a revelational symbol of recognition that another Jewish nation existed in West Africa under the colonial rule. The reseacher further explained how the conspiracy of Arab league had in 1956 few years before the Nigerian independence of 1960, pressured Britain to relinquish and obliterate such historical records and activities that would remind the younger generation of Biafrans, of any such account relating to the ancient symbol of "The Star of David". This fundamentally, eroded the laudable idea of having history as a subject/course in tertiary institutions within the Nigerian educational curriculum, thereby dumping even professors in the murky waters of ignorance and intellectual dwarfism, with particular reference to the events that transpired particularly before the Nigeria independence in 1960. Further discoveries clearly proved the fear expressed by the Arab League of Nations against the State of Israel whose sovereignty was forcefully restored in 1948 in what was left of the dissolved Ottoman Empire. This created the anxiety of the Arab world to think that the nation of Israel could wake up one day to historically lay claim to the ownership of Biafraland in far away West Africa, owing to the ancient symbol of "The Star of David", same way with what happened to the land of Palestine. It was those analysis as given to the British government by the Arab League of Nations that prompted the former to give a matching order to it's colonial office in Lagos in the year 1956, to terminate and seal any history that will reveal and enlighten the younger generation of Biafrans about their originality and the historical symbol of the Star of David. The British government also having the record of the Israeli bitter dealings against the opposing Arab countries in the disputes that led to the declaration of the independence of the sovereign state of Israel, harboured that fear of Israel's claim of aboriginal Biafra as another Jewish territory. This jolted the colonialists to promptly destroy traceable links that would lead to the Star of David as a sign of established relationship with Biafrans. The researchers of the Indigenous People of Biafra (IPOB), have adequately exhumed most of these concealed historical artifects, distinctively pointing to the authenticity of Biafrans as Jews found in the West African sub-region. It is therefore exceptionally incumbent upon the Israeli government to carry out it's functions whatsoever, pertaining the facilitation of Biafra sovereignty as a nation. The needed urgency for the independence of Biafra from Nigeria defunct federation is tied to the efficacy of interest the nation of Israel presently has in Africa. Biafra is strategically placed in West Africa for the overall positive and fruitful achievements of the nation of Israel. An independent Biafra will most definitely showcase another Jewish State of Israel from this part of the world, wholesomely having unrestricted interest of the Israeli nation is adequately protected. The leadership of the Indigenous People of Biafra (IPOB) worldwide, must have officially appreciated the State of Israel from the office of the Directorate of State (DOS) over numerous assistance accorded the body coupled with the protection of her leader, Mazi Nnamdi Kanu, essentially. It is important therefore, for the Israeli government to courageously override all international protocols that are breeding impunity and oppression against the people of Biafra. This can be done by pressurizing Nigeria into accepting the independence of Biafra. If the Israeli government should mandate the Nigerian government to duly accord recognition to the sovereign State of Biafra, would definitely do nothing about it other than to totally accept the reality of a sovereign Biafra, thereby averting possible opposing corresponding consequences. 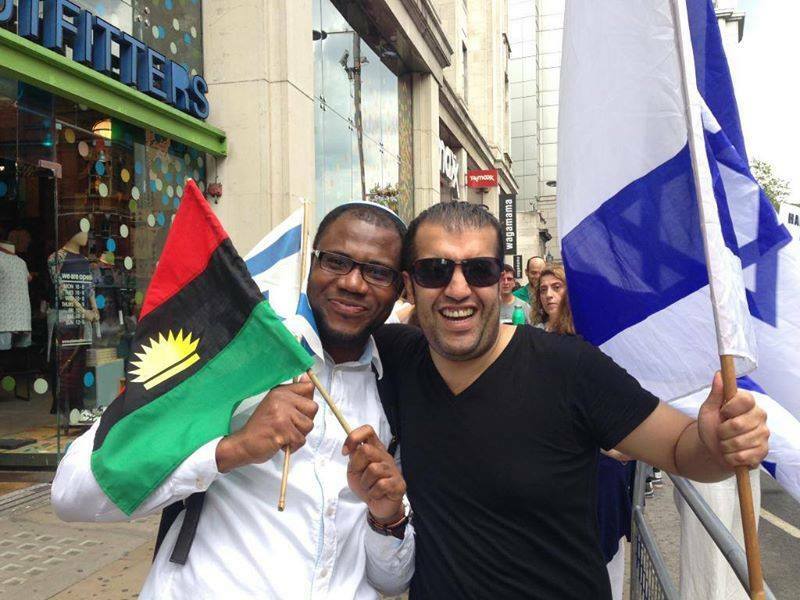 The Israeli government will very definitely have enormous amount of gains to garner from a free Biafran nation especially in the areas of Agriculture, Mines, Information/Communication Technology (ICT), Nuclear Development, Military Development and Economic Alliance, due to the ingenuity and business acumen of the Biafran populace. There exists no longer any disputation regarding the Jewishness of the Biafran people. It is unarguably a dismantled barrier in the entire Biafra territory. The Israeli government has now an uninhibitive legislative enactment by reason of the newly promulgated law of the Jewish State, to employ all necessary actions that will facilitate the sovereignty of the nation of Biafra. The global community has maintained deafening silence on the plights of Biafrans in Nigeria but the Israelis being kiths and kins to Biafrans, should do everything expeditiously needful to actualise the restoration of an independent Biafra. The much desired nations for bilateral relationships with the Israeli nation are early awaiting an independent Biafra. The ball has now been played into the court of the Israeli government and of course, that of all the Jewish people the world over. Let the card be played according to expectations.